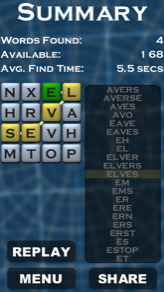 Challenge your vocabulary skills and see how many words you can find in a randomly generated 4x4 grid of letters! Large database of possible words. Colors indicate whether the word is valid, invalid, or valid but already found. Timed mode for exciting game play. Mode available without a timer for more relaxed game play. Share your scores through Twitter and/or Facebook.